MANILA, Philippines - Two Star Cinema entries to the 2014 Metro Manila Film Festival (MMFF) have earned a total of P640 million at the box office, its highest record to date in the annual movie event. 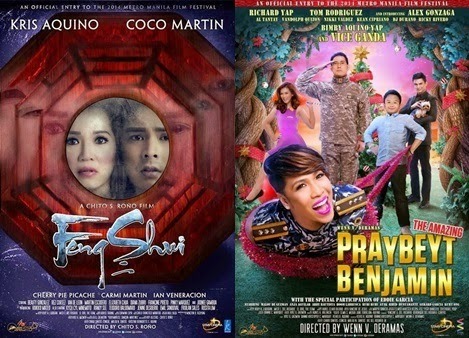 Star Cinema announced the total earnings during the thanksgiving party on Friday held for the success of 'The Amazing Praybeyt Bejamin' and 'Feng Shui 2'. "Feng Shui" earned a total of P225 million, making it the highest-grossing Filipino horror movie. Meanwhile, "Praybeyt Benjamin" gross reached P415 million and has took the highest-grossing opening day record of P53.3 million. The two films already surpassed the performance of previous year entries of Star Cinema which got P618.8 million in the box office. "Girl, Boy, Bakla, Tomboy" took home P436 million, while “Pagpag: Siyam Na Buhay” made P182.75 million. In a separate report from Metro Manila Development Authority chairman Francis Tolentino, he said that the 8 entries in the 2014 MMFF already earned a total of P1.014 billion at the box office as of January 7. The figure was a 2.6 % increase from the previous year. It means that 'Praybeyt Benjamin' and 'Feng Shui 2' share on the total receipt is more than 60 percent. Aside from the two Star Cinema movies, M-Zet Films entry 'My Big Bossing' and Quantum Films' 'English Only Please' are among the top 4 films of MMFF 2014.